Canada is where the US is in the mid-1990s -- still on the highly sloped part of the curve where monetary policy is effective (also note that Sumner quotes Milton Friedman from 1998). The neo-Fisherite piece of the curve is on the right hand side -- where the US was during the depression, where Japan is now and where the US and EU are moving. Canada shouldn't have a problem hitting its inflation targets yet. Let's check back in 20 years. Have been reading your blog over the last few days or so, and so far loving it. Can't believe I hadn't found it earlier. As an another non-economist (physics background but currently working in finance), it's sort of refreshing to be able to follow arguments illustrated with models and data-fits vs. either a) the usual blather (don't want to be too harsh but it seems that people like Sumner have a vague model in their head [one which I see you actually did the work and built an implementation of] and go on about it in a hand-wavy manner) or b) people like Williamson who "mathurbate" without an real sense of intuition or explanation. Curious as to why you don't write it all up and publish it? I know you call this blog a working paper, but I think you're genuinely on to something important/new and you have enough to get at least a paper or two out of it. Target it at a lower ranking journal, perhaps of the heterodox variety? I'd have to say it's partially out of laziness ... I did get submission privileges at the economics e-journal (and could put up a paper on the arXiv). I have a draft partially LaTeX-ed up. Another issue is that I might not yet be able to respond to something like narayana kocherlakota paper "money is memory" because I'm not sure I quite understand it. It seems like a whole bunch of irrelevant nonsense coupled with a narrative flow. 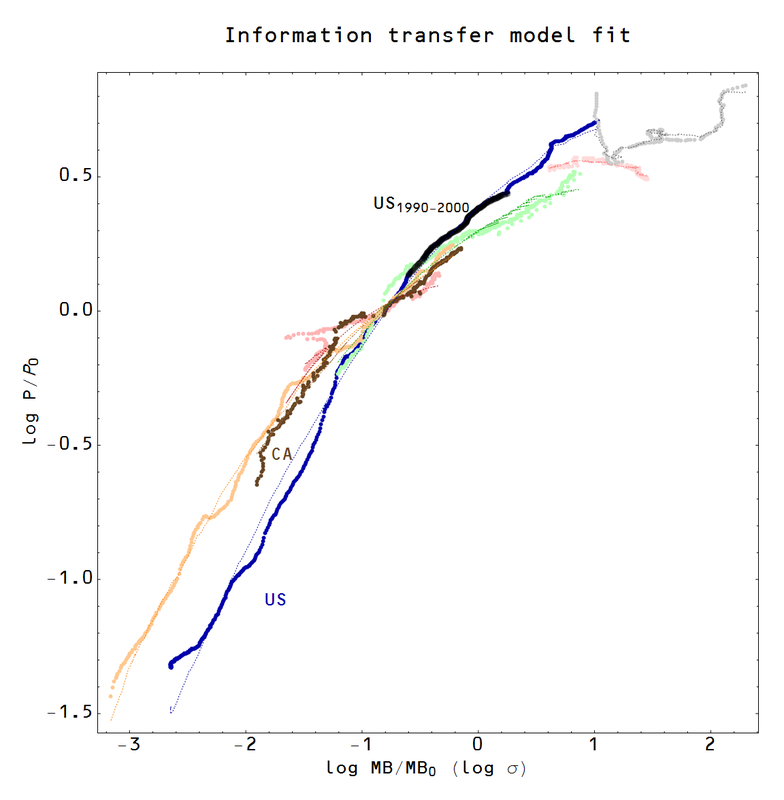 A couple of comments on the upper plot: Why do you label the x-axis as Log (MB/MB0)... I think I got the parenthesis right there, correct? I drilled down a couple of links, but I'm still not clear on what MB0 is. You're normalizing obviously, but by what exactly? "As part of the series of updates I mentioned earlier using the currency component of the monetary base (neglecting reserves)"
But recall that vault cash is currency as well as being reserves, so is that really what you want to say? I thought that you intended to use the now defunct UK version of M0, which corresponds to the Fed's "currency in circulation" which is currency held by the non-Fed-deposit holding public + currency held in bank vaults, where by currency I mean paper notes and coins. Shouldn't you say "neglecting bank held Fed deposits" instead of "reserves" since the part of the monetary base you're attempting to exclude are "bank held Fed deposits?" (which of course are also reserves, but not all the reserves). Which brings me back to the x-axis... is M0_UK a better description than "MB" (or something like that). Basically "currency in circulation." You don't really mean MB do you? The model as yet is not good enough to distinguish between these three measures. I use MBCURRCIR (monetary base, currency in circulation) in all posts after January 2014, and I used M1 and BASE in earlier posts. I actually compared them here. But yes the graph label should technically be MBCURRCIR or "M0". The price level is CPI less food and energy (core CPI). Jason, sorry, I'm not very adept at figuring out exactly what these FRED plot data series are... I'm reading the "Notes" tab on the 1st two: MBCURRCIR and WCURCIR, and I don't see the difference in the text of the paragraphs... they both say the same thing don't they? What is the distinction? Ah,.... so you adjust MB0 and P0 for each country to achieve the best fit then? Yeah, I guess those two only differ in their seasonal adjustment. But M1 currency in circulation is different, but can't be distinguished by the model. "The recent injections of money by the Fed are mostly interest-bearing reserves, and hence are not high-powered money." Could that be why you find that currency in circulation is the measure of money to look at when considering P rather than MB? Also, I confirmed from Dan Thornton via David Andolfatto that the Fed does not pay IOR on reserves in the form of vault cash (not that it would matter much probably, since reserves in the form of Fed deposit balances are probably considerably larger). You mention above we might want to check back with Canada in 20 years... in 20 years would you expect that Canada would produce the same P0 and MB0 for a best fit? Also, what is the intuition behind a larger MB/MB0 ratio causing a knee in the P/P0 curve? Does that mean there's some lack of information transfer efficiency going on? Can you describe in words why that makes sense? 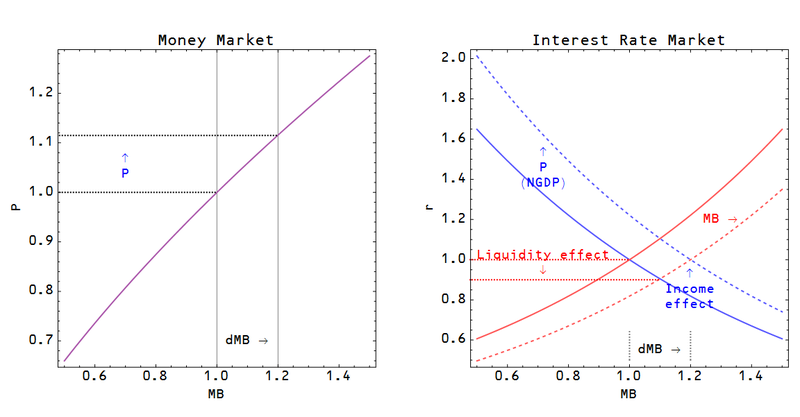 Regarding the high powered money, I did some hand-waving that borrowed from Sumner's reasoning that the massive increase in the base is seen as temporary, hence BASE feeds into short term interest rates, while physical printed currency in circulation MBCURRCIR is more permanent, so feeds into long term interest rates (see here). The rationale for its use in the price level was purely empirical -- MBCURRCIR works better. But it has to be some component of the base because that forms the "yardstick" by which everything else is measured. The base is like the IPK kilogram France. It defines the amount of information transferred by one dollar. This last piece goes into your third question: what causes the "knee"? It basically occurs at MB = MB0, or log MB/MB0 = 0. That's the point where the relative behavior of f(x) = x and g(x) = log x change. The Taylor series around x = 1 of both functions match to first order. Why is this important? Because log x determines the information content (unit of account) and x determines the total amount of information in the economy (medium of exchange). That's why I've referred to it as the unit of account effect on the blog. Imagine trying to send data over the internet when the definition of byte is changing ... that's monetary economics. Regarding your comment on Canada -- the values of P0 and MB0 are the constant over 1980-2014 for Canada. So yes, the same values should still give the best fit. For the US the parameters are the same over 1960-2014. WWII forms a break ... the constants are different before and after (but they are the same from 1929-1944). I referred to it as a phase transition at one time. Regarding my 1st question (high power money)... IOR does not come into it then (as Sumner is saying)? and the slope m = (1/κ - 1), which falls as κ goes from 0.5 (quantity theory of money) to close to 1 (Japan). That's the changing slope of the graph at the top of this post. But IOR doesn't seem to be relevant to inflation/lack of inflation in the information transfer model. Jason, thanks for all the great information here. re: IOR: I see... I just find it curious that for purposes of finding P you've found that currency in circulation (MBCURRCIR) is what's important, not the monetary base (MB). And currency in circulation corresponds exactly to Sumner's "high power money" (i.e. the part of MB which does not pay interest). But like you say, that's the case in the US, but not necessarily elsewhere. "where unit of account (log MB) enters into κ and MB is is the medium of exchange. " So UoA = log MB? or UoA = log MBCURRCIR? What is the distinction you're making between UoA and MoA? It seems like it might not be the one I'm used to (which I've never fully figured out). But I think there's broad agreement between post-Keynesians, Rowe, Sumner, Sadowski, Koning and Woolsey that the MoE includes public owned commercial bank deposits as well as base money (MB). UoA = the word "dollar" and the symbol "$", whose value is defined as a specific quantity of MoA, (e.g. $1 = 1 oz gold). The make the point more explicit, Bill has substituted "electricity" for gold as the MoA, and thus part of the UoA becomes $1 = 1 kw-hr of electricity. He did this to create an example of an MoA which was not simultaneously an MoE. In this example I like to say that the UoA includes not only the names "dollar" and symbol "$" (and other related words and symbols, like "cents") and the internal relations between these things (e.g. 100 cents = 1 dollar), but a "definition" of a dollar in terms of the MoA as well, which assigns the UoA a value. Other people seem to want to attach the "definition" to the MoA itself (JP Koning, for example) and keep the UoA as purely a system of words and symbols and the internal relations between them w/o any connection to anything of value. Others don't seem to have such a clear breakdown. With fiat money things get more complicated. Sumner says that MoA = MB. He says paper notes are essentially "paper gold." There is not broad agreement on this AFAIK. Needless to say, I'm still confused about UoA vs MoA, however I have a fairly clear picture of what is encompassed by the terms UoA and MoA together, and I can accept them being used as synonyms. MoE, in contrast, seems clear enough to all. However, I'm not sure how you're using MoE. You seem to be excluding checkable commerical bank deposits from MoE, which I haven't seen anyone else do. It's not clear if you're also excluding bank owned Fed deposits from MoE. "What is the distinction you're making between UoA and MoE?" Also, what exactly is κ? I've been sloppy in several areas -- I don't like inventing new notation and like to borrow from what economists are used to. But then MBCURRCIR is just too long of a variable name for nice equations. But basically I mean MBCURRCIR when talking about price level or long term interest rates and MB when talking about short term interest rates. Regarding MoE and UoA, I imagine it is odd -- it's actually what's new/different about the information transfer model (otherwise the ITM is just the quantity theory of money plus supply and demand). I'm not saying MBCURRCIR is the totality of the MoE, I'm saying the MoE derives its value from MBCURRCIR (call that x). That is to be contrasted with the UoA effect of MBCURRCIR which goes as ~ log MBCURRCIR (call that log x). What this means is if I double MBCURRCIR, I double the MoA but I only add log 2 ≈ 0.7 to the UoA (if the starting point is 1, then the result is 2 for the MoE and 1.7 for the UoA). If we look at a smaller change, this reverts back to what (I think) is more standard economics: log(1 + ε) ~ ε for small ε. The function i(x) = log x is the information content of x (the number of bits it takes to define x), while x (i.e. a(x) = x) is the amount of x. UoA is related to i(x) and MoE is related to a(x). The amout of MoE is not MoE = a(MBCURRCIR), it's just MoE = f(a(MBCURRCIR)) = f(MBCURRCIR) while UoA = g(i(MBCURRCIR)) = g(log MBCURRCIR). And both enter into the price level. Anyway, it's what's new about the ITM. I think it is the only coherent way it's ever been discussed in economics. Regarding MoA, I think that is just a different way to say UoA. Money has three (major) functions: UoA, MoE and store of value. κ is the "information transfer index" it measures the relative information content of a unit of supply vs a unit of demand. It appears no one seems to agree on the MoE or UoA. People seem to use the words "my model" or "my definition". I really think economists have no idea what they are talking about (in this specific area). No one seems to know why fiat money has any value at all! There's a glossary in it for example. Jason, Lol... yes, when you drill down into concepts like MoA/UoA/MoE or why fiat money has value... there's an alarming amount of disagreement amongst economists. There's no "there" there. I think JP Koning has done an admirable job of trying to keep track of the different views and produce a coherent narrative of them. If you look in his sidebar for the tags UOA, MOA and MOE you'll find a variety of articles on the subjects with many links to Woolsey, Rowe and Sumner amongst others. His own opinions have changed over time. Also, are you aware of Mike Sproul? He has a different idea he calls the "backing theory." His comments can be found on JP Koning's site and Glasner's, etc. I don't buy into the backing theory completely, but he makes an interesting argument (he basically argues that there's really no such thing as fiat money). He attempts to show how a small amount of anchor assets (owned by the CB) can be multiplied up into a much greater amount of currency / base money through the central bank purchasing government bonds... but he also argues this is a dangerous thing to do. Also, did you see my link to Mike Freimuth's post in a comment to Glasner's latest post (the one you link to above)? I thought that was an interesting take too. Shoot! I just checked and Mike didn't pay his bills I guess... his post is gone... the site expired on 5/8/2014! Jason, have you seen this post by Sumner? 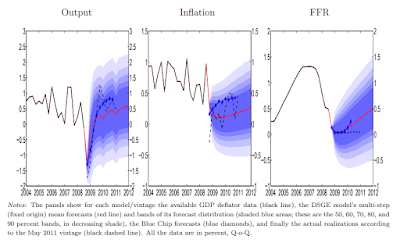 "Low interest rates are deflationary"
Want to make your own ITM S&D diagrams? Monetary offset: what are the assumptions? Do monetary aggregates measure money demand? A neo-Fisherite rebellion? Yes, please.